Because it was He and Because it was I” – the famous line from Montaigne’s “On Friendship” speaks to a degree of serendipity that brings people together. There is no particular rhyme or reason as to why this person holds significance amongst the many people we encounter daily but they do. Is this the “appointment of heaven” that Montaigne speaks of? or are we attributing feelings in a “see what we want to see” scenario? How can we be certain that what we feel is genuine and moreover that these feelings will be reciprocated? To know for sure requires a leap of faith, a decision that bears priceless rewards but also risks devastating emotional damage. For taking this leap means exposing the one vulnerability that even the toughest of people are susceptible – the heart. Therein lies the central question behind Luca Guadagnino’s Call Me By Your Name – a beautifully constructed summer romance that asks: is it better to speak or die?
" If a man should importune me to give a reason why I loved him, I find it could no otherwise be expressed, than by making answer: because it was he, because it was I.
Answering this question is more difficult than the simplicity of the question would suggest especially at the age of adolescence where most of us are still finding our own identities, adjusting to the awkward changes occurring within us and straddling that line between the cynicism of adulthood and the optimism of childhood. 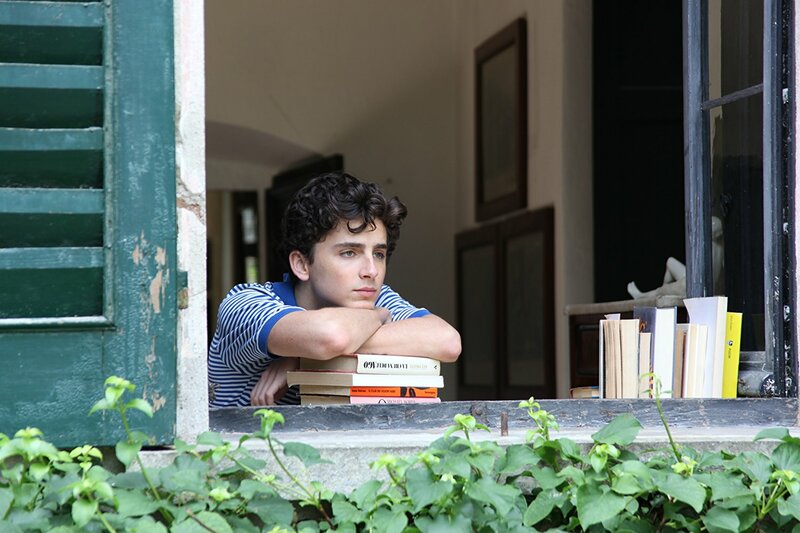 This is precisely where we find Elio (Timothée Chalamet) the young lead in Guadagnino’s screen adaptation of the Andre Aciman book of the same name.Wiser than most his peers in some fields, he knows history, reads voraciously and puts his own twist on the music of Bach. Unsurprising perhaps given that he is the son of a Greco-Roman culture professor (Michael Stuhlbarg) but where Elio could be confused for a much older man in this regard he is also very much still a teenager. Rocking Talking Heads t-shirts and boasting about almost sleeping with the cute French girl next door, the scrawny 17-year-old who is not quite a boy but not yet a man is about to take a massive step towards growing up. The catalyst for this monumental shift occurs when Elio meets Oliver (Armie Hammer) – the latest in a long line of annual summer interns that work with his dad. Confident, brash and strikingly good-looking – the American student turned research assistant takes up Ellio’s room for the summer much the chagrin of the younger man. Their relationship is tentative to start only exchanging glances at one another from across the conjoining bathroom that divides their two rooms. Seven years and a host of physical and cultural differences separate the two. Oliver is as carefree as the colloquial “later” he uses as a farewell. One moment he is wowing the crowd with his dance moves, the next, correcting the professor’s entomology knowledge. In many ways, he is what Elio is not – a fully formed man sure of his identity. For Elio, yes, the allure of the summer and the girls in their seemingly endless array of sundresses provides plenty of opportunities to experiment but Elio is far more reserved than the older guest across the bathroom choosing instead to bury himself behind books or a pair of headphones. As one character suggests later in the film “those who read a lot have a tendency to hide who they really are”, maybe this is the case for Elio or perhaps it is less a case of hiding and more an instance of not knowing exactly who he is himself. Despite their obvious differences, the two do eventually bond as they spend more time together. Connecting due to their mutual Jewish faith (a noted outlier in Italy just a few short skips away from Vatican City) and a mutual deep seeded attraction to one another (unbeknownst to either party) the relationship gradually turns from friendship to romantic. It’s a slow-simmering culmination for Guadagnino but unlike other LGBT romances, it is less about the longing and secrecy of the relationship as much it is about the passion and strength of that love. As such, Guadagnino and cinematographer Sayombhu Mukdeeprom shoot in constant motion. Even when the characters are stationary there is still motion in the shot. Whether this is in the blustering winds rippling through their loosely attached shirts or insects buzzing in the background, motion is always present as if to remind us that time is always moving forward thus our time with one another is constantly fleeting. The exception to this is when Elio and Oliver share intimate moments together. Here the shots are more static in effect mimicking that time stops/slows Big Fish effect. Some will criticize the film for its slow pace over the course of its runtime but Guadagnino uses all of it with purpose. In slowly building Elio and Oliver’s relationship, he has created investment to it and that is what allows the film to convey the emotions it sets out to. Matching the continuous pace of the shot composition is the urgent piano score by Sufjan Stevens who also provides a number of heart-tugging original songs that overlay several key scenes. Like his solo work outside of the movie industry (including the stellar albums Carrie & Lowell and Illinois), Stevens songs are deeply emotional encapsulating the specific mix of melancholy, passion, and desire that the film carries throughout. All of these elements in conjunction with standout performances from the up and coming Chalamet and Hammer make for a beautifully crafted film from Guadagnino. Like his previous effort (A Bigger Splash), the third act of Call Me Your Name is what really drives the film home. Where A Bigger Splash opted for more of a twist ending, however, this time Guadagnino instead goes in the other direction offering a quieter (but still incredibly emotionally powerful) ending. It is here that Call Me By Your Name vaults itself into Best Picture contention. Behind a masterful near verbatim reading of Aciman’s original words from the book (wisely unaltered in the on-screen adaptation) by Elio’s father and one long take of Chalamet over the closing credits, Guadagnino places the finishing punctuation over his masterpiece with definitive authority. Inevitably Call Me By Your Name will draw comparisons to other critically acclaimed LGBT movies of recent years like Brokeback Mountain, Carol or last year’s Best Picture winner Moonlight – a narrative that will continue well into the awards discussion – but to box in a film simply by its subject matter is limiting the power that the film has. Guadagnino makes a concerted effort to not make the relationship feel like “the other” or something to be ashamed of as so many of similar films have in the past. In fact, much of the struggle within the film does not come from external forces but internally within Elio and Oliver themselves. In doing so, Call Me By Your Name remains focused on the developing relationship making it not just a great love story between two men, but a great love story. Period. Wisely remaining self-contained to just the summer unlike its source novel which chose to explore the relationship over 20 years, Call Me By Your Name captures the feeling of first love in all its beauty and its scars. It becomes immensely relatable because when we experience this first love, we are often naive, unable to cope with this powerful emotion so even if we are blessed by some stroke of serendipity as Montaigne posited, that does not guarantee that what comes together stays together. But as Elio’s father so eloquently put it: ” to feel nothing so as not to feel anything is a waste” so do not be so quick to throw away that experience for even if it ends in colossal failure, you still have that experience to reflect on. That fleeting summer where for an instance it was just the two of you. Together. In blissful harmony.